Description: Middlesex and part of Hertfordshire. Taken from Drayton's allegorical poem of England and Wales "Poly Olbion". Charming county map illustrated with Nymphs and Peasants. Coloured. 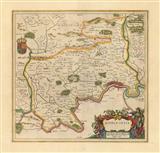 Description: County map of Middlesex, now greater London. Towns marked include Enfield, Pancras, Osterley and Staines. Based on a survey by John Norden. Coloured. Description: County map. Miniature map. Coloured. Description: County map. Based on John Norden's early map and reduced for the 'Brittania'. Coloured. Description: Attractive county map of Middlesex, including London, with decorative cartouche and compass rose. 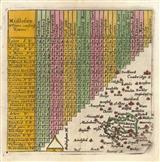 Description: Curious miniature county map with mileage table showing distances from the towns in Middlesex. Coloured. Description: County map with decorative cartouche and Royal Coat of Arms. Original colour. Description: Attractive and rare map of Middlesex, now mainly Greater London covering the North and Northwest of the city. Description: London to Reading.Early road map. Coloured. Description: County map. Large English Atlas. Coats of arms run along the two sides. 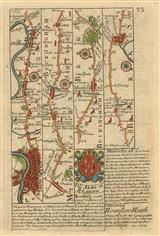 Description: Large, detailed county map with multiple text panels and inset of St. Paul's. Original outline colour.